What do you get when dinner and dessert have a baby? 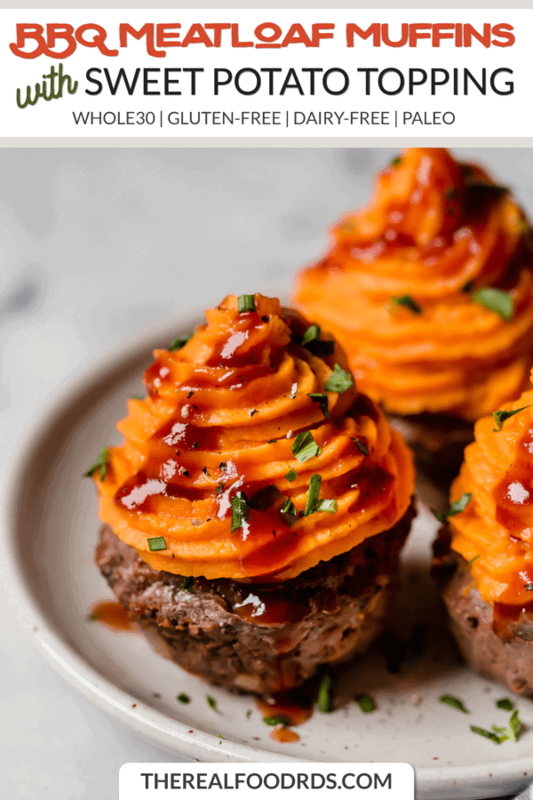 You get BBQ Meatloaf Muffins with Sweet Potato Topping that are almost too cute to eat. Meatloaf regularly finds its way on my weekly meal plan for several reasons, not only because it’s delicious and one of my favorite comfort foods, but it’s also easy to make ahead, freezes well (both raw and fully cooked) and it’s a more economical way to get grass-fed beef into our diet because ground meat is way less expensive than steak, but you already knew that. The only downside is that it takes a while to a bake an entire 2-lb. loaf of meat. That and my kids don’t think it’s the prettiest meal. So for those two reasons alone I’ve started making these mini-meatloaves using a muffin pan. Aren’t they cute? They’re also great because they’re pre-portioned making them an easy addition to my hubby’s lunchbox as well. 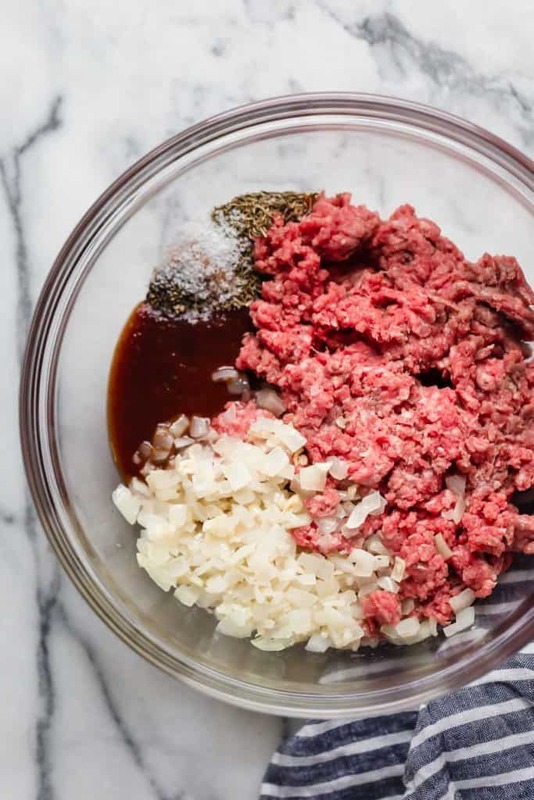 Because saving time in the kitchen is of the utmost importance here at The Real Food Dietitians, we’ve kept this recipe simple with just five ingredients in the meatloaf (not including salt and pepper) and two ingredients in the topping. 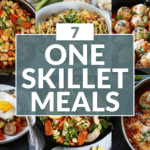 Just seven ingredients total! 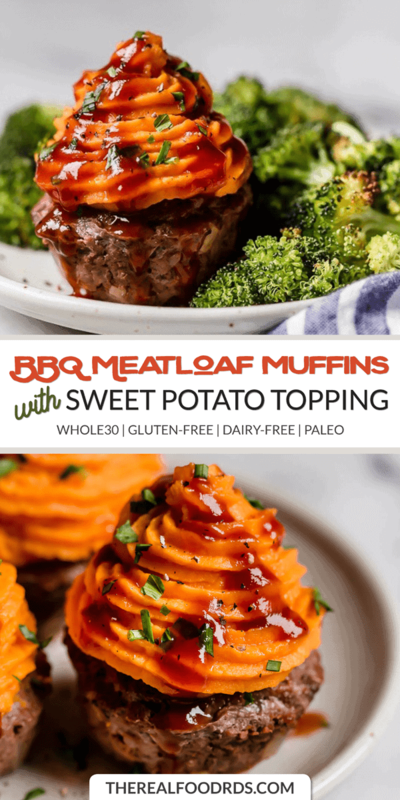 This is just a taste of how simple these BBQ Meatloaf Muffins with Sweet Potato Topping are… Now see for yourself how easy they are to make in this video. 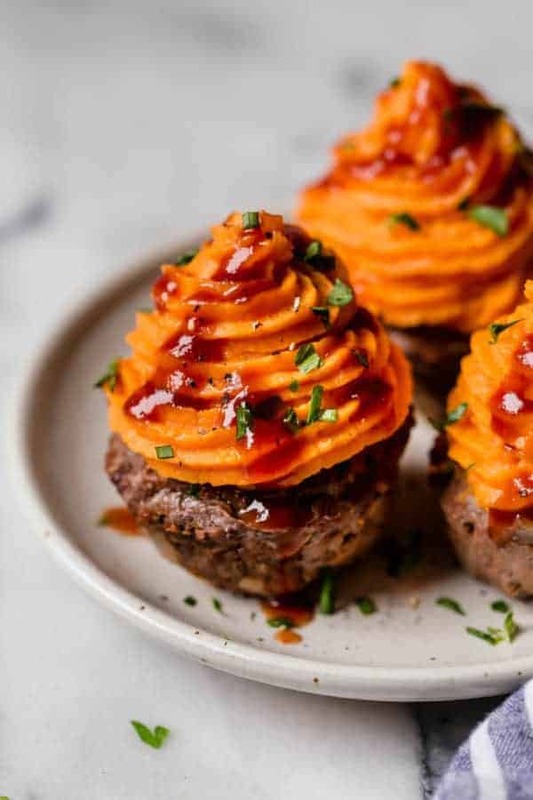 Sweet potatoes make the perfect topping for savory meatloaf. Don’t be intimidated by the pretty sweet potato topping swirls in the picture. Keep in mind, we’re food bloggers and piping pureed root vegetables onto small discs of meat is what we do. Feel free to dollop, scoop or spread your topping on if that’s easiest for you. It’s still going to be ridiculously mouth-watering delicious, especially with a little drizzle of your favorite barbecue or hot sauce. 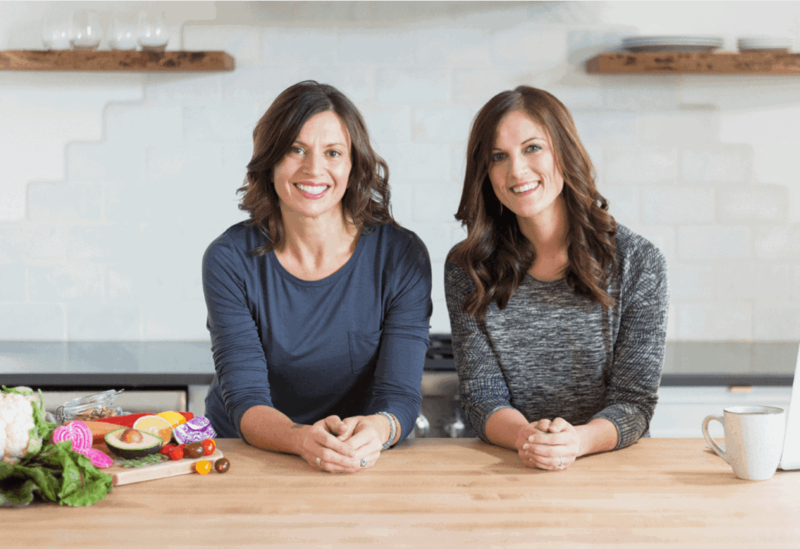 We like Tessemae’s and The New Primal when we’re Whole 30-ing because it doesn’t have any added refined sugar, but you can use any good-quality store-bought sauce without high-fructose corn syrup. Heck, you can even use this easy Homemade BBQ Sauce that you can whip up in just minutes (it’s even Whole30 and super budget-friendly). If you do want to get all fancy-schmancy with the topping, just scoop your pureed sweet potatoes into a piping bag fitted with a star tip. Or you can use a quart-sized zip-top bag in which case you’ll want to gently press the mixture to the bottom of the bag and seal it. Then snip off a small bit of one corner of the bag to create a piping bag. 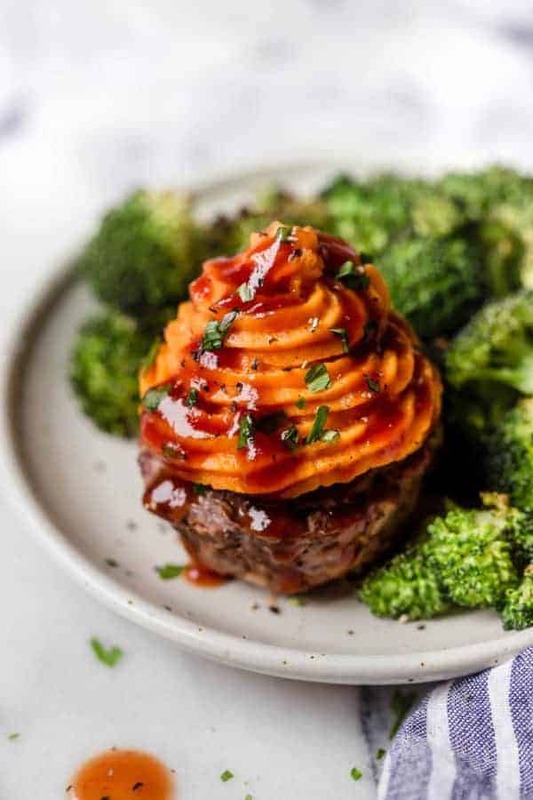 Now you can squeeze and swirl your way to fancy BBQ meatloaf muffins with sweet potato topping. Just like the pros do. 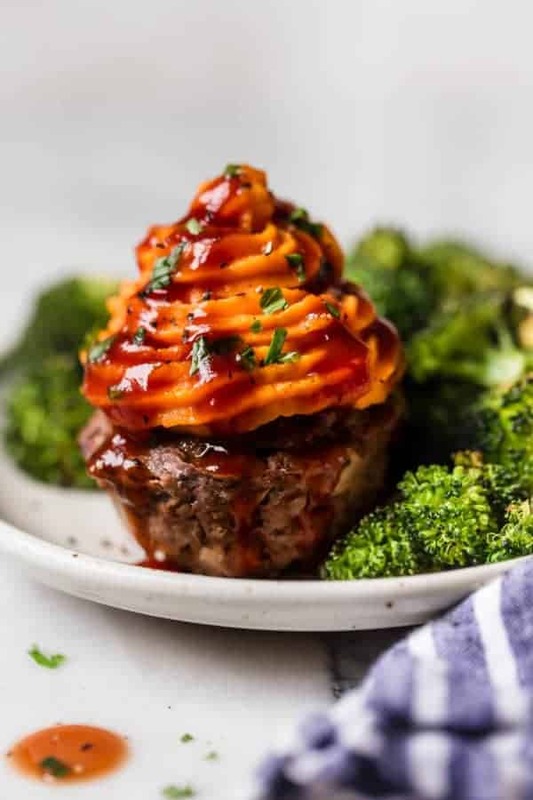 An extra drizzle of smoky barbecue sauce and a sprinkle of thyme or chopped parsley elevates these cute little BBQ meatloaf muffins to glorious, savory dinner cupcake status almost instantly. Garnish is always optional, of course. You can see why these are so kid-friendly. 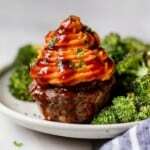 They don’t even look like meatloaf – and they’re easy to freeze once baked, cooled and topped. 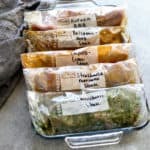 Just return them to the muffin pan and place in the freezer until frozen before transferring to a freezer-safe container with lid or a large zip-top bag. 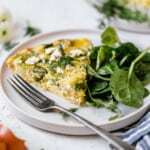 Thaw overnight in the fridge and reheat in a covered skillet with a few drops of water until heated through or reheat in a toaster oven or microwave. You’ll just need to add a vegetable side dish or two and dinner will be on the table in no time. 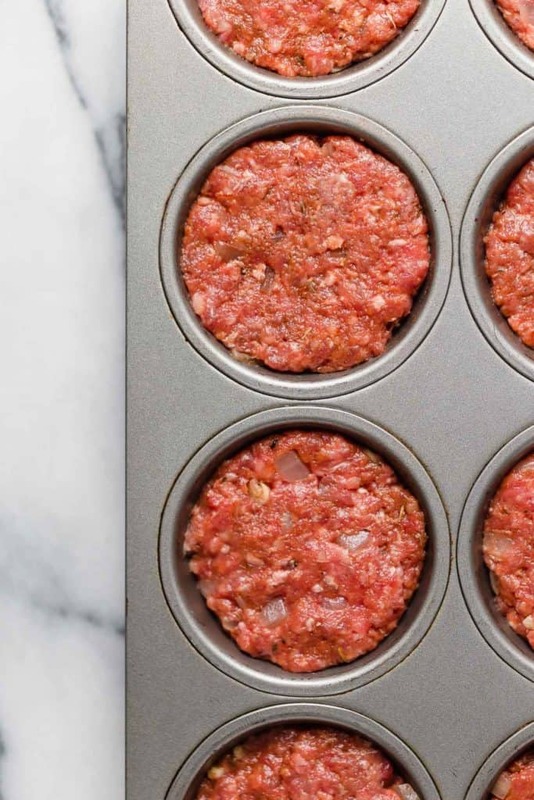 Alternatively, you can bake the meatloaf muffins, cool and freeze them. Then, thaw overnight in the fridge. Reheat as directed above and top with freshly made sweet potato topping just before serving if you want to keep them looking fancy. Divide meat mixture evenly among 12 wells of a muffin pan. While meatloaves are baking, steam sweet potatoes until tender, about 10-12 minutes. 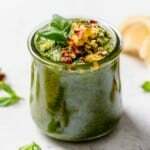 Drain and puree sweet potatoes and coconut oil or butter in a food processor, or mash well with a fork. Pin now & Make later! Thanks Ashley! You could even make them into mini-muffins for a uber cute appetizer! These are adorable and they look delicious! This is one I have to try!! Thanks! They’re definitely worth the try – especially if you have kids! You have outdone yourself here Jessica! I have everything I need to make this, will make a batch tonight! 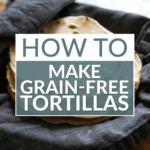 Have you done this with ground turkey? Yes, we have. Our best successes came from using dark meat ground turkey (all white meat or very lean turkey tends to be quite dry). Jessica, I made these for my husband and son the other night. My husband is very picky and we all loved them. This was a recipe I will make again. Thank you! That’s incredible! I love hearing when picky eater “selective palate” husbands fall in love with one of our recipes. This one is always a huge hit at my house as well. I made these on the weekend and we all loved them!! We are in the middle of our first round of Whole30, so this really worked for us. I followed the recipe exactly except I had some cooked mushrooms that I really needed to use up, so chopped them and mixed them in with the meat before putting it in the muffin tins. Will def make these again, even after we are done our Whole30!! I’m so glad you loved these. They’re a huge hit with my family too – and great idea to add cooked mushrooms. I think I’ll be adding those to the next batch I make. 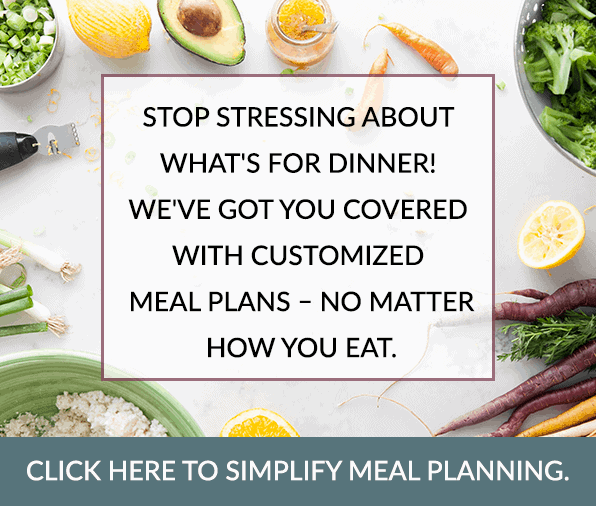 Good luck with your Whole30 – don’t forget to check out all of our Whole30-friendly recipes in the drop down menu under “recipes”. It sounds like this is a regular sized muffin tin. How long would these cook for mini muffins? I’m looking to make them as an appetizer for a pot luck. I haven’t tried making them as minis yet (though I LOVE that idea) but I’m guessing the baking time would be about half that fit regular sized muffins. We think you’ll love ’em!! Love love love this recipe. It’s made its way into our regulars. I hide shredded carrots in there and the kids don’t know the wiser! Hi! These look so good! What’s your favorite bbq sauce? I also like a few brands that are local to me in Boulder – Rat’s Woodshack and Schultz’s – both are really good but contain sugar or honey making them a no-go for Whole30. For a less-local brand, I’ve also tried the Annie’s BBQ sauces and they’re good too! I made these and they were so delicious but they totally crumbled apart and were swimming in oil from the beef. Do you think I just need to mix everything together better, or am I doing something else wrong? I’m sorry to hear they fell apart on you. You may have better luck using a lower fat grind (say, 90% lean). Also, the grind size could make a difference as well if yours was a coarser grind. Hope that helps! Thanks! I’ll try them again with a leaner and finer grind beef! mine turned out that way too 🙁 and I used a 93% lean. I will try adding an egg and bread crumbs next time. We are not doing the whole30. Great recipe though, we absolutely loved it!! Did you use a regular size muffin pan or one of those jumbo pan? Either way, is a serving two muffins? We used a regular size muffin pan and two muffins is one serving. Enjoy! YASSS! So great to hear you loved this recipe! 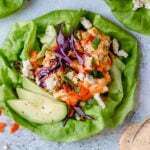 Can you use ground turkey or chicken? White meat ok? Or too dry? 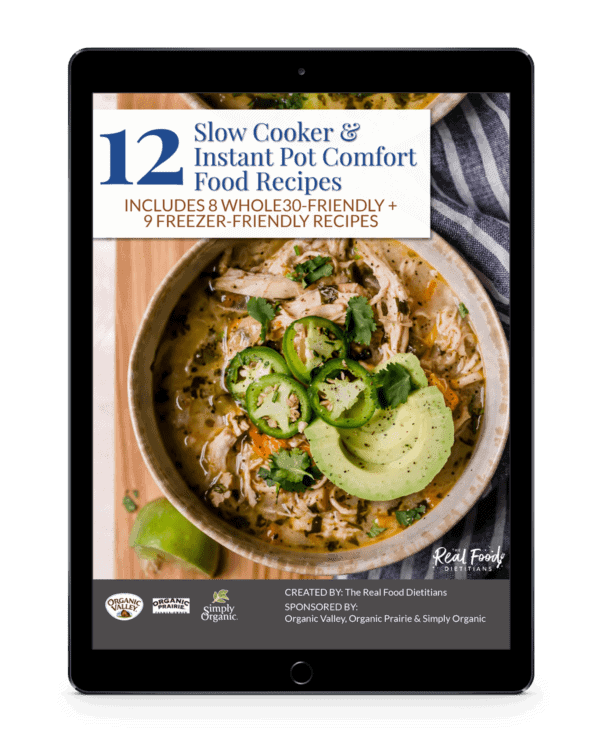 Yes, you can use ground poultry for this recipe however, you’ll want to use dark meat ground turkey or chicken and watch them carefully so they don’t overcook and dry out. I made this recipe and it tasted amazing!! BUT all my meatloaf cups broke apart. They did not stick together well. Any suggestions on what could’ve gone wrong? Hmmmm…we have not had this issue. You could try adding an egg next time you make them. This is incredible! What a fun (and hearty) way to celebrate your husband’s birthday. These are extremely delicious!!! But once the meatloaf has been cooked and I try to take it out of the tin, my little beef muffins fall apart, so I’m not sure If its because I am not packing enough beef in each section of the tin, or if it’s just too greasy, mine seem to be full of lots of liquid around it. So was just curious if this happens for you or anyone else. Hmmmmm, we have not experienced this so it’s hard to give you a reason why that happened. It’s definitely helpful to use a non-stick pan and pack the meat nice and firmly into the pan so it sticks together.